Founder’s Message - Is It Asking So Much To Be Noticed? When your child cannot walk or talk or feed herself, when unexpected illness or injury steals her possibilities, you agonize about the limitations of her life. Will her days be a pain-filled succession of doctor appointments and uncomfortable hours in a wheelchair ignored by all but a television set? H.A.L.O.’s mission is to ensure that children who have devastating and complex neurological conditions feel noticed and as cherished as any other human being. We strive to provide them opportunities to experience happiness and the variety of life. It is therefore gratifying when people like Dr. Murray Feingold and physical therapist Susan Maltz and volunteer Francine Fahey and even entire communities like Keene, NH take notice of what can make their lives better, and DO something about it. We applaud these heroes who are highlighted in this issue of H.A.L.O. Reports and thank you for your continued interest and support of H.A.L.O. The sun-kissed days of autumn bring many traditions: apple-picking, football rallies and leaf raking. This year the H.A.L.O. Foundation once again supported the annual hayride at New England Pediatric Care. Nearly all the residential and day students get bundled up and have their wheelchairs loaded onto the Krochmal Farms wagon. “It provides a very different sensory experience — being up high, in the fresh air, taking in the scent and the clop, clop of the horses — it’s an activity all can participate in,” said Executive Director Ellen O’Gorman. Physical therapist Susan Maltz, MPT, spent the last 14 years of a 35-year career working in Boston Public Schools programs for children with special needs, and loved her work. “Part of my caseload was children in special needs preschool and it was very rewarding when the kids were able to progress to regular education in elementary school,” said Susan. One of the best aspects of her job was working with students over an entire school year. Most received PT just once a week, but she was able to assess capabilities and progress over the long term. She also developed deep relationships with children, families and classroom staff. Working with school children was fun, too. She used toys and gadgets to engage and motivate them. For instance, instead of repetitive exercises she utilized scooter boards, tricycles and normal playground activities. “Rather than rehabilitation, the goal of school therapy is to insure safety and independence in the school environment, which increases access to the school curriculum,” Susan explained. Some students were mobile and verbal while others had involved conditions and were confined to wheelchairs, so there was a great deal of variety to her work. Another positive of the job was not having to deal with insurance companies, but she had to apply to the state to obtain equipment for growing individuals. “I would spend hours writing letters to the state to justify custom wheelchairs or the right headrest for positioning the children, then it could take three or four months,” Susan said. Some home use items that would benefit the children were not approved as “necessary” by the state, so Susan took the initiative and sought outside assistance for families, often immigrants unaccustomed to the health system. Over the years she has worked with H.A.L.O. to obtain a gait trainer, large stroller and five or six adaptive tricycles for family recreation and access to the community. “Children need recreation and stimulation. Activities that are normalizing and age appropriate accomplish this while maintaining and building muscle strength,” she said. Only once did Susan request equipment for a classroom. “I felt a little guilty asking for equipment I believed the state should supply but when I knew it wasn’t going to happen, I was very grateful that H.A.L.O. could help,” Susan explained. The Rifton adaptive tricycle donated to the Gavin Middle School special needs program several years ago was regarded as “cool” by standard and special needs students alike, and many in the five special education classrooms benefitted socially and physically from riding it. As she reconfigures in retirement, Susan continues to network with colleagues about the needs of students . She also volunteers at her church and is expanding the Spanish conversational skills she acquired to communicate with students’ families. 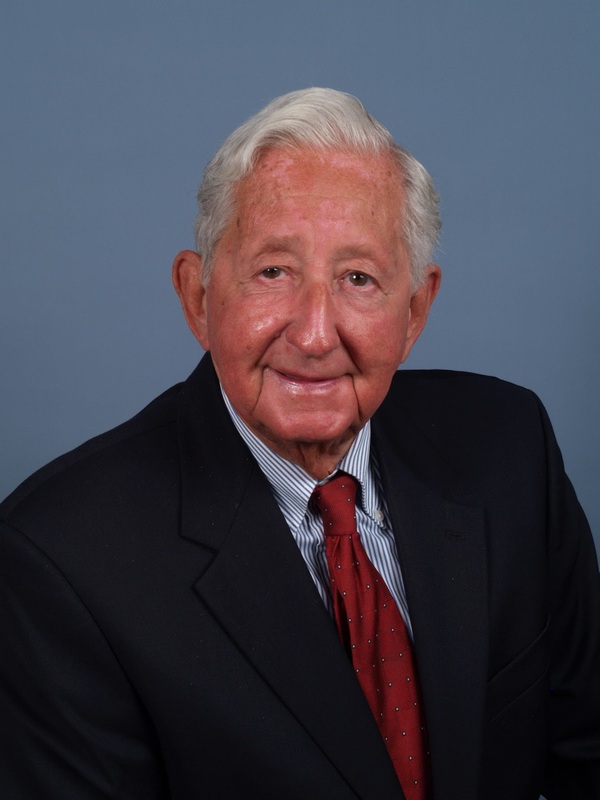 With great sadness, we report the passing of Dr. Murray Feingold, a specialist in birth disorders and genetic diseases and advocate for compassionate care. Dr. Feingold spent more than 40 years treating children and campaigning for respectful and coordinated diagnosis and treatment. He was a long time advisor to H.A.L.O. In the 1980s Dr. Feingold founded The Genesis Fund (now The Genesis Foundation) to support the Feingold Center for Children at Children’s Hospital in Boston and created satellite clinics to serve 60,000+ children and families in Massachusetts and New England. He also taught at Harvard, Tufts, and Boston University medical schools. Dr. Feingold wrote a syndicated newspaper column “Second Opinion” for many years. As one of the first medical commentators on radio and television, he was known to millions of households for the “Medical Minute” on WBZ-TV in Boston. In 2014 he was inducted into the Massachusetts Broadcasters Hall of Fame. Francine, right, cooks a staff breakfast and leads a game session for residents every Friday. Fridays are special at Plymouth Rehabilitation and Health Care Center in Massachusetts. That’s when former assistant teacher Francine Fahey returns to cook breakfast with the pediatric residents, who are wheelchair bound and have severe neurological impairments. Francine whips up waffles and pancakes, egg dishes and paninis – anything that doesn’t require an oven— in one of the classrooms. She shops and donates all the ingredients. The six residential students observe preparations and inhale the heavenly aromas, said Education Director Linda White. There is much vocalizing and smiling, and even those kids who struggle with muscle control manage to hold their heads high when Francine is cooking. Proceeds from the meals fund the annual Halloween field trip to the Roger Williams Zoo in Providence, RI. The fun doesn’t end with the meal, though. Afterwards staffers pair up with the kids to play games like Jeopardy and Trivial Pursuit, helping them work switches to respond to questions. The residents Francine worked with a decade ago are now in day programs for young adults over 22, or community group homes, so she doesn’t see them much, but she enjoys her mornings with the younger students. 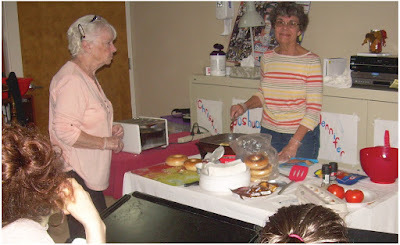 In her free time Francine also volunteers at a food pantry and is passionate about making her own greeting cards. 4th Annual ‘Kids Care’ Walk & Roll in Keene, NH. 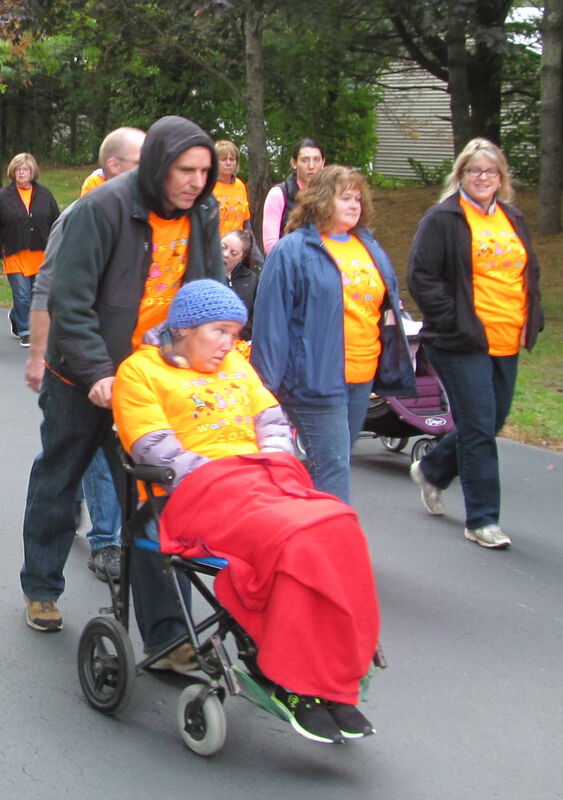 About 170 walkers and “rollers” registered for the 4th Annual ‘Kids Care’ Walk & Roll continuing a Keene, NH tradition of embracing the children who live at Cedarcrest Center for Children with Disabilities. Most of the 25 children who currently reside at the facility traveled the level 2.1 mile course with their own families, staffers and trustees. Adults, children and pets from across the community also participated. An additional 130 people made donations, and major business sponsors included Liberty Mutual Insurance, Markem-Imaje, StingRay Optics, Autex Mazda and Clark-Mortenson Insurance, with in-kind support from C&S Wholesale Grocers, Inc., Commonwealth Dairy, The Keene Sentinel and the Monadnock Radio Group. “The community’s support and interaction with our kids is incredible,” said Jeff Fuller, Cedarcrest spokesman. Proceeds will be used to provide cultural and recreational enrichment opportunities for children who live at Cedarcrest, including field trips, visiting musicians and performers and community outings.